Cuiaba stadium is handed over to FIFA today, but seats weren’t installed until two days ago. In Sao Paulo the recent test game proved not enough and one more is planned. Meanwhile Curitiba’s Arena da Baixada remains most delayed. Exactly today the Mato Grosso state authorities and local organizing committee are handing over Arena Pantanal to FIFA. Works on temporary World Cup infrastructure have been ongoing for some time, but from today onwards FIFA will take care of all aspects of the preparations. Meeting this deadline was as hard as with all the previous ones. As an example, last seats were installed last weekend, though back in April they were declared to be ready by May 6. Finishing touches coincided with the Sunday test game between Atletico Mineiro and Santos. It enjoyed a moderate popularity with 18,683 seats occupied of some 30,000 opened. As the game ended, Arena Pantanal is being handed over without even one capacity-crowd test. However, the test was described as satisfying. That can’t be said about another game held on Sunday. We already wrote about numerous glitches at the Arena Corinthians during its first game. And while fans may have been excited about their new stadium, FIFA isn’t. The organization now demands another test and the crucial part is opening also the temporary stands. Sunday fixture against Figueirense had attendance at 36,694 people, while there are 68,000 seats in total to be used during the World Cup. The game will take place on May 29, just two weeks before tournament opens at this very stadium. 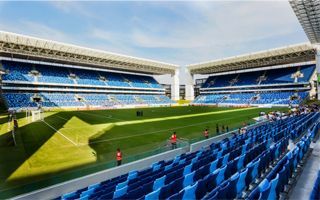 Corinthians are to face Cruzeiro and hopefully finally dismiss all doubts about Arena Corinthians being able to hold the opening game on June 12. Though the stadium’s inner roof’s glass cover won’t be installed for the World Cup, it’s still a minor flaw compared to Curitiba’s Arena da Baixada, continuously the most delayed host stadium. Not only did the investor need to scrap its retractable roof, but also didn’t manage to deliver the media building. As a result, the steel skeleton will be standing adjoined to the stadium, while journalists are will need to take their work to a temporary tent nearby. Just like in two previously cities named above, in Curitiba a major test game was held last week, on May 15. Atletico Paranaense, the stadium owner, played Corinthians in front of 23,000 people. Again, the test didn’t supply a capacity crowd, but its evaluation suggests the stadium is now operable. Apart from the three most delayed hosts, finishing works on surrounding infrastructure are ongoing in Porto Alegre and Manaus, while holding games should pose no risk in remaining seven cities.